4.25 out of 5 , based on 4 reviews. Responsive theme from Themeco with loads of features including Advance Customizer and multiple ready designs. 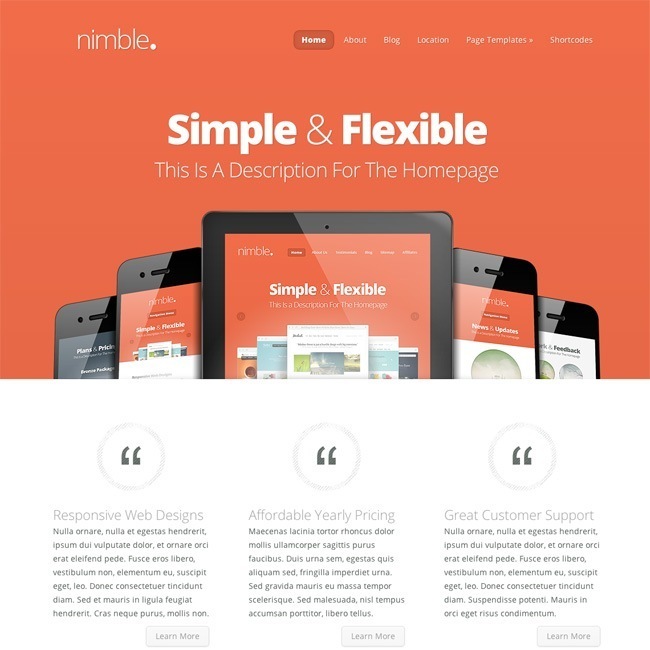 Nimble theme by Elegant Themes is another beautiful eye catching responsive WordPress theme with ability to build multipurpose websites. This theme allows you to build a modern look of corporate website, a modern magazine or blogging based website as well as any entertainment based site with its features. It is highly responsive to devices with different resolutions whether it is a desktop display or mobile or tablet. It comes packed with ePanel which is provided by Elegant Themes for their every theme. You get access to ePanel on activation of theme on dashboard. This ePanel allows you to toggle on and off features, adjust your layout, manage advertisements, control colors, optimize for search engines and much more. So customization can be done in no time. Other than this, it gives several templates to build pages like contact form, sitemap, fullwidth pages, portfolio, blog, image gallery, etc. With this theme you get 5 different layouts for portfolio page like portfolio with sidebar, portfolio with small image grid, large image grid, medium image grid & portfolio with no text, blog with right sidebar, etc. It gives support to plenty of shortcodes some of which are buttons, icons, content boxes, toggled content, tabbed content, slideshow, image slider, easy tooltips, social media icons, login form, author info, column layouts, custom icons list, pricing tables, testimonials, dropcaps, quotes and much more. There are different options that are available to add different colors and fonts to different elements of the site. This theme provides with a very good design and and amazing user experience to the visitors. It also supports breadcrumbs for the child pages in order to give a better navigation experience to the visitors. This is one of the very flexible and responsive theme that looks great on all the devices.It also gives good browsing experience to the visitors and allows to easily conform to the user’s screen.The visitors will be able to easily access the site from anywhere and anytime. Nimble Theme provides with many theme options that allows to customize the theme as per the requirements. It also gives you the full control over the settings. ET About Me Widget: This widget will display the About Me information. ET Adsense Widget: This widget will display the Adsense Ads. ET Advertisement: This widget will display the Advertisements. ET Search: This widget will display the custom search field. This theme provides with 3 footer areas and the widgets for it can be easily dragged and dropped. There are different templates and shortcodes that are available for the theme that can be applied to any post or page. ET Learn More Block: Learn more block can be added from here. ET Box: Box related to info, warning, download, bio and shadow can be added from here. ET Button: A button along with the content and link can be easily added from this option. ET Tabs: It allows to add the tabs along with different effects and contents. Author Bio: One can add the bio of the author along with the image from here. There can be header background image that can be set for a particular page or post. Header Background Image option appears below the page or post. Note: Depending upon the Page Template that is selected there will be different ET Page Template Settings that will appear in the bottom. There are different templates that can be easily used and that are provided for each page and those are: Blog Page, Contact Page, Full Width Page, Gallery Page, Login Page, Portfolio Page, Search Page and Sitemap Page. Fonts: One can easily set the header font and body font color by selecting it from the drop down. Menus: All the settings related to Menus can be done from here. Widgets: Settings related to Footer and Widgets can be done from here. General Settings – One can easily set the Logo, Favicon, Grabbing first post image, Blog Style Mode, Call To Action Button Text, URL for it, Number of posts per page, Date format, Responsive shortcodes, Google Fonts subsets and Custom CSS from here. One can also display the sliders from Featured Slider tab. Navigation – One can exclude the pages and categories from the navigation bar, Showing Dropdown menus, Displaying Home links, Sort Pages Links, Order Pages Links by Ascending/ Descending and Number of Dropdown options that are shown. Layout Settings – There are 3 different tabs that are available for it such as Single Post Layout, Single Page Layout and General Settings. The settings related to the layout can be done from here. Ad Management – All the settings related to add can be done from here such as Enable Single Post 468X60 banner image, It will also consists of the options to add banner image, destination url and adsense code for it. Colorization – The main color font, link color, menu link color, menu active color, footer links color etc. can be changed from here. SEO – All the settings related to SEO can be done from here. It will consists of the options related to Homepage SEO, Single Post Page SEO and Index Page SEO. According to ones own choice all the settings related to it can be done. Integration – In order to add third party code in the theme this tab settings can be used. It will allow you to add the code on the header code, body code, single top code as well as single bottom code. This will directly allow you to add the code without touching any other piece of code. The visitors will not wait for long in order to visit a particular site. The speed and time taken to load a particular page plays a very important role. So I decided to check the Google Page Speed of the Theme. The page speed for mobile devices was 74/100 and for the desktop it was 89/100. In order to check whether the particular theme followed the standards and practices of WordPress and to scan all its files in order to know about any malicious and unwanted code. I checked it by activating 2 plugins Theme Authenticity Checker (TAC) and Theme Check. 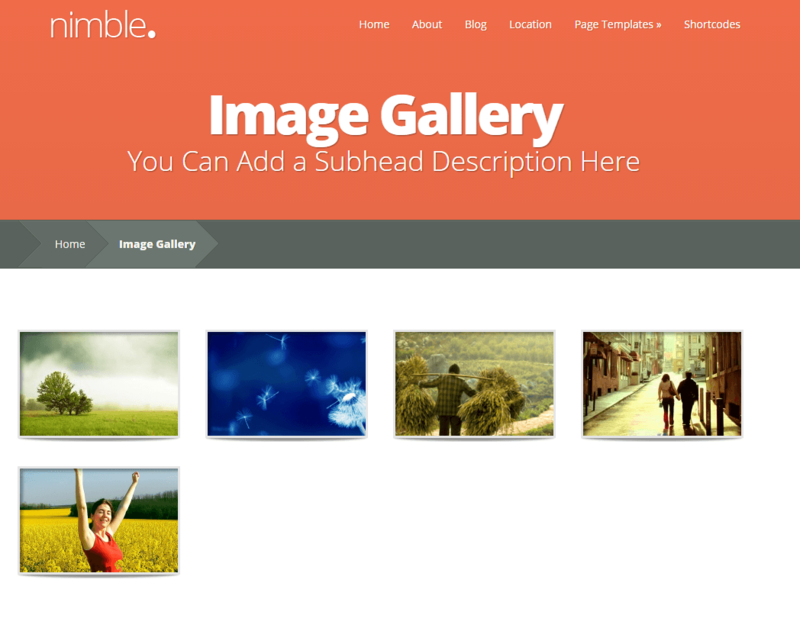 Nimble Theme provides with all the theme options that you are searching to build a good website. It also provides with different page attributes that eases the work. The flexibility that it provides to build any of the site is indeed commendable. I would surely recommend this theme to build any of the site, that gives a full control from the theme options. Even a person with very less technical knowledge will find it easy to understand. s the speed and performance of any site plays a very vital role so the performance of this theme is optimized by W3 Total Cache. Allows to add slides to make it appealing for the visitors. Provides with the Color visualizer tool that will help to find the hexadecimal values. Each item provides with the Custom CSS where one can apply different CSS to different elements. Provides with Full width page options for blog pages. It does not provide any way to add site identity or tagline for the site. This theme does not provide with a page builder. Very helpful and easy to customize theme just like any other elegant theme. WOW! Nimble is just like its name, light and quick. I used this theme to create my Portfolio website n my God it looks just stunning!! Color schemes provided in this theme are awesome. Well done Elegant Themes. Waiting for lot more to come. I was planning to build my website for a corporate business. 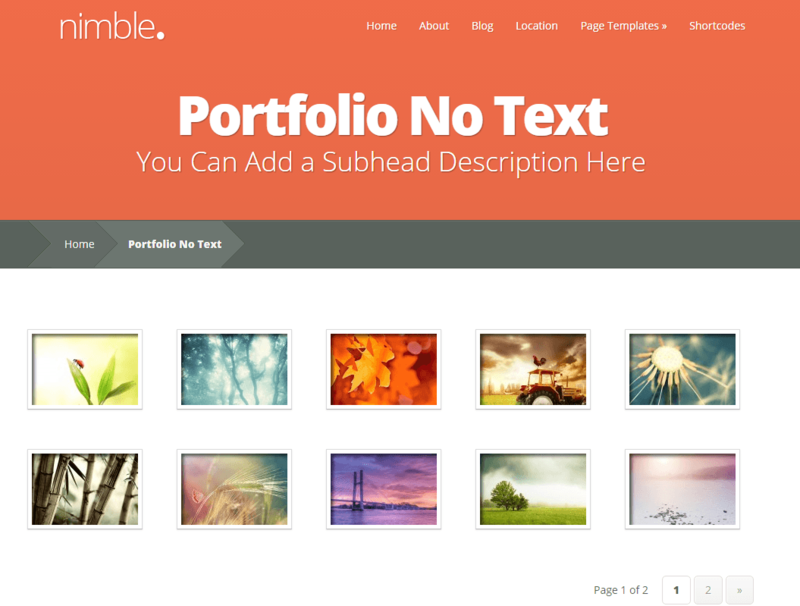 After evaluating with so many themes, I came across Nimble theme by ET. It provided me with features such as slider, portfolio section, pricing tables, etc. I was really impressed by the looks that it provided for my site. I will surely recommend this theme that gives you the freedom to build any of the website as per your requirements and needs. The looks offered by this theme is amazing. As a developer I really liked this theme. I was searching for a theme which is very good in look for my Corporate website. Thanks to theme developers. It fulfills all my requirements. It actually looks awesome. 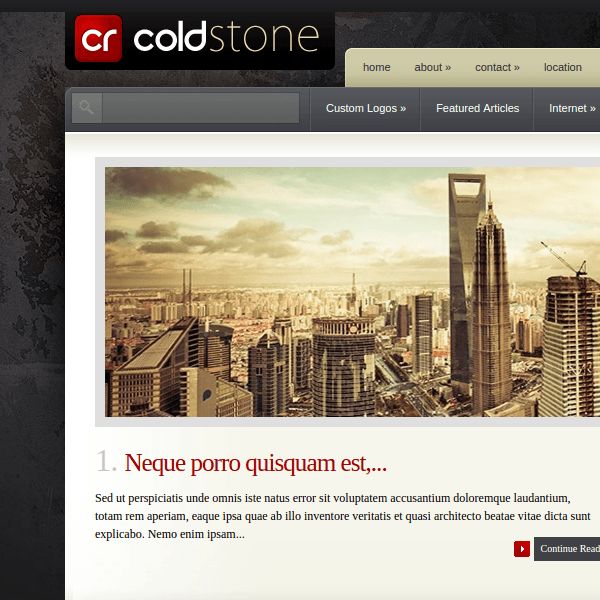 It is the best for Corporate and professional blogging theme.